On Tuesday, October 9th, Felix Baumgartner will participate in the final stage of the Red Bull Stratos project, the highest sky diving mission in history. He'll be jumping from 23 MILES above Roswell, New Mexico, which is enough to consider this a space jump. This is what you need to know. What's the deal with this stratos jump? Red Bull is known for its sponsorship of extreme sports around the world. The stratos jump might just be the most audacious thing they've attempted. Basically, a huge helium balloon with a space capsule attached will rise to 120,000 feet, and a man, Felix Baumgartner, will then jump out of said capsule and head towards Earth. During the jump, he is expected to hit 690 MPH within 30 seconds and become the first man to break the sound barrier. Think about that for a second. In preparation, there have been two successful jumps from 72,000 and 96,000 feet. The world record is 102,000 feet. The man who holds the 102,000 foot record, Joseph Kittinger, is actually working with Red Bull on this jump. Kittinger set the record 50 years ago. That's damn cool. If Baumgartner lives through the 120,000 foot leap, he'll go down in the record books as the man with the largest set of balls to ever set foot on this planet. How's this all goin' down? Red Bull is planning on launching a gigantic helium filled balloon from Roswell, New Mexico that will then carry the capsule and Baumgartner up to 120,000 feet, which is expected to take about three hours. Then he jumps out. 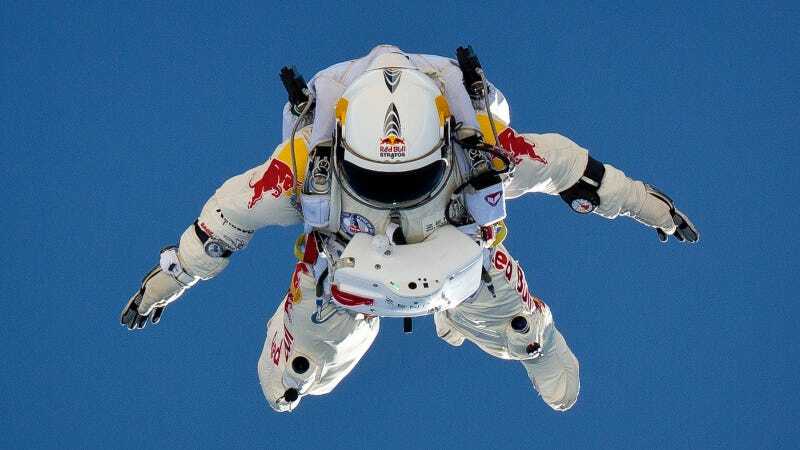 He isn't just jumping out in your typical sky diving wear either, Baumgartner is going to outfitted up the wazoo with a state of the art pressurized suit, GPS, g-force meters, a special parachute that can stop a tail spin, two real parachutes, wide angle cameras, and multiple layers to survive the cold of space. If all goes to plan, the jump should last about 10 minutes. He will open his chute five minutes in and descend for five more minutes. Once he jumps out, the capsule and balloon will separate, allowing the capsule to return to Earth. Good weather and vast areas of nothing to be destroyed really make this perfect. Having a man and a capsule falling down over New York or Los Angeles would be a bad thing. Who is this Baumgartner character? Baumgartner is a 43-year old Austrian that has a reputation for being a bit of a daredevil. He's a BASE jumping champion (you name it, Felix has probably jumped off of it), flown across the English Channel wearing a carbon wing, and he's one of three people to jump from over 70,000 feet and actually survive. He's been skydiving since he was 16 and was also in the Austrian military. His life is basically about records. If he successfully completes Tuesday's jump, he'll be in the record books once again. If he fails, he'll enter some very different books. I wanna watch! How do I watch? Just watch it right here silly! Red Bull's livestream of the jump will be right here on Jalopnik starting at 7:45 EST Tuesday morning with the video beginning at 8 AM EST/5 PST. The jump was supposed to occur this morning, but questionable weather forced it to be postponed until tomorrow morning.